Scientists reveal in more detail than ever before how white blood cells kill diseased tissue using deadly granules, in research published today in PLoS Biology. The researchers, from Imperial College London and the University of Oxford, used 'optical' laser tweezers and a super-resolution microscope to see the inner workings of white blood cells at the highest resolution ever. The researchers describe how a white blood cell rearranges its scaffolding of actin proteins on the inside of its membrane, to create a hole through which it delivers deadly enzyme-filled granules to kill diseased tissue. The study looked at a type of white blood cell called a Natural Killer (NK) cell that protects the body by identifying and killing diseased tissue. "NK cells are important in our immune response to viruses and rogue tissues like tumours. They may also play a role in the outcome of bone marrow transplants by determining whether a recipient's body rejects or accepts the donated tissue," said Professor Daniel Davis, from the Department of Life Sciences at Imperial College London, who led the research. The scientists hope that learning more about how NK cells identify which tissues to kill and initiate the killing process could lead to better healthcare for some patients. Professor Davis said: "In the future, drugs that influence where and when NK cells kill could be included in medical treatments, such as the targeted killing of tumors. They may also prove useful in preventing the unwanted destruction by NK cells that may occur in transplant rejection or some auto-immune diseases." The new visual resolution of NK cell action is a result of a novel imaging technique developed in collaboration with physicists at Imperial, and the use of a super high-resolution microscope at the University of Oxford. The researchers immobilised an NK cell and its target using a pair of 'optical' laser tweezers so that the microscope could capture all the action at the interface between the cells. 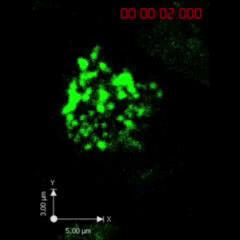 They then watched inside the NK cell as the actin filaments parted to create a tiny portal and the enzyme-filled granules moved to the portal, ready to pass out of the NK cell and onto the target to kill it. Dr. Alice Brown, also from the Department of Life Sciences at Imperial College London, and one of the researchers who carried out many of the experiments, said: "These previously undetectable events inside cells have never been seen in such high resolution. It is truly exciting to observe what happens when an NK cell springs into action." The contact between an NK cell and its target is only about a hundredth of a millimetre across and the miniscule actin proteins and granules change position continuously over the few minutes from initial contact until the target is killed. The microscope has to be able to capture images quickly enough and in high enough visual detail in order to reveal their activity. Most microscopes view images in the horizontal plane, so to view an interface between two cells at any other orientation would require 'stacks' of multiple horizontal images combined to make a 3D image. This significantly limits the speed at which cell dynamics can be viewed and reduces image quality. Professor Paul French from the Department of Physics at Imperial College London, who helped develop the microscopy with colleagues in the Photonics Group, said: "Using laser tweezers to manipulate the interface between live cells into a horizontal orienta tion means our microscope can take many images of the cell contact interface in rapid succession. This has provided an unprecedented means to directly see dynamic molecular processes that go on between live cells." Professor Ilan Davis, a Wellcome Trust Senior Fellow at the University of Oxford, whose group applies super resolution technique to basic cell biology research said: "Our microscope has given us unprecedented views inside living NK cells capturing a super-resolution 3D image of the cell structures at twice the normal resolution of conventional light microscope. This method, developed at University of California San Francisco by Professor John Sedat, maximizes the amount of light captured from the specimen while minimizing the amount of stray light inside the instrument." 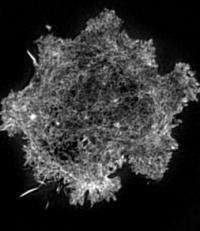 In immune cells, 'super-res' imaging reveals natural killers' M.O.